Google Search App in your Android phone can now search your apps as well. If you look closely, you will see it similar to Spotlight search in iOS. On the search results page, you also see a dedicated tab ‘In Apps’ to show the matching results from apps installed on your phone. Google search app can access various apps to show results. If you do not want Google to access it, you can revoke access to Google search app and hide these results. You can turn or all apps from showing in search or just specific apps. 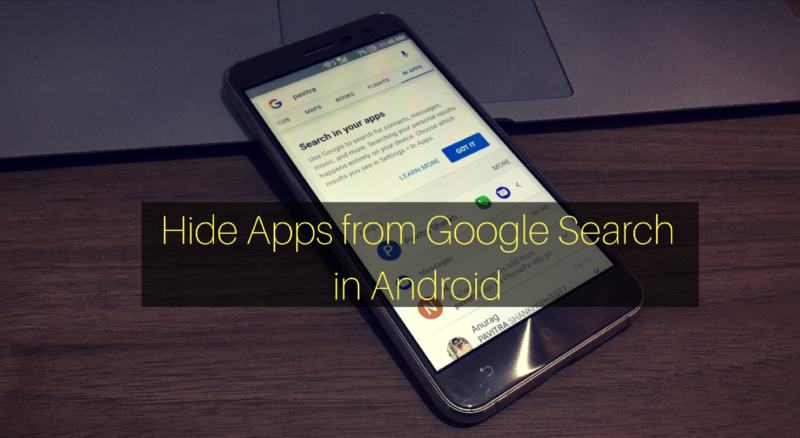 In this guide, I will show you how to hide apps from Google search in Android. Open the Google Search app and tap on hamburger icon at the top left. Now select Settings. In the Settings page, tap on ‘In Apps’. Here, you see the list of apps installed on your device. You can remove the tick in front of the app you do not want to show in search results. Google search can access most of the apps to show your contacts, emails, messages, music and more. This feature is helpful but can leak your important private data. Anyone can use it to search within your device. So, it is better to hide data from sensitive apps from appearing in the search. While the feature in the current state is limited, Google will surely expand it with deeper integration. So, it is better to know about it before Google accesses your personal data.